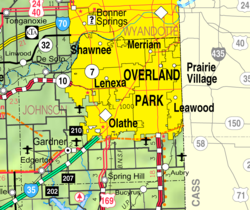 Fairway is a city in Johnson County, Kansas, United States, and part of the Kansas City Metropolitan Area. As of the 2010 census, the city population was 3,882. In the 1820s, this area was reserved for use by the Shawnee people, who had ceded lands east of the Mississippi River to the United States government. The Shawnee Methodist Mission was moved here in 1839, when a school for the Shawnee was established. After the American Civil War, the Shawnee were relocated to Indian Territory (present-day Oklahoma). The mission is a National Historic Landmark and today is operated as a museum. In the 1930s, as Kansas City suburbs were developing, a developer laid out a subdivision near a golf course. It was named Fairway from its proximity to several driving ranges. Fairway was incorporated in 1949 and is known as "The City of Trees". Fairway is located at 39°1′26″N 94°37′45″W﻿ / ﻿39.02389°N 94.62917°W﻿ / 39.02389; -94.62917 (39.023988, -94.629213). According to the United States Census Bureau, the city has a total area of 1.15 square miles (2.98 km2), all of it land. As of the census of 2010, there were 3,882 people, 1,749 households, and 1,062 families residing in the city. The population density was 3,375.7 inhabitants per square mile (1,303.4/km2). There were 1,833 housing units at an average density of 1,593.9 per square mile (615.4/km2). The racial makeup of the city was 95.3% White, 0.8% African American, 0.3% Native American, 1.4% Asian, 0.7% from other races, and 1.4% from two or more races. Hispanic or Latino of any race were 3.0% of the population. There were 1,749 households of which 27.0% had children under the age of 18 living with them, 52.0% were married couples living together, 6.8% had a female householder with no husband present, 1.9% had a male householder with no wife present, and 39.3% were non-families. 31.6% of all households were made up of individuals and 9.8% had someone living alone who was 65 years of age or older. The average household size was 2.22 and the average family size was 2.83. The median age in the city was 41.4 years. 21.8% of residents were under the age of 18; 4.5% were between the ages of 18 and 24; 28.4% were from 25 to 44; 30.6% were from 45 to 64; and 14.8% were 65 years of age or older. The gender makeup of the city was 47.0% male and 53.0% female. As of the census of 2000, there were 3,952 people, 1,781 households, and 1,102 families residing in the city. The population density was 3,468.8 people per square mile (1,338.5/km²). There were 1,842 housing units at an average density of 1,616.8 per square mile (623.9/km²). The racial makeup of the city was 96.18% White, 0.40% African American, 0.35% Native American, 1.24% Asian, 0.76% from other races, and 1.06% from two or more races. Hispanic or Latino of any race were 2.23% of the population. 22.4% were of German, 18.3% English and 16.3% Irish ancestry according to Census 2000. There were 1,781 households out of which 26.9% had children under the age of 18 living with them, 53.8% were married couples living together, 6.9% had a female householder with no husband present, and 38.1% were non-families. 31.4% of all households were made up of individuals and 10.6% had someone living alone who was 65 years of age or older. The average household size was 2.21 and the average family size was 2.81. In the city, the population was spread out with 21.9% under the age of 18, 3.9% from 18 to 24, 32.7% from 25 to 44, 26.1% from 45 to 64, and 15.5% who were 65 years of age or older. The median age was 40 years. For every 100 females, there were 86.9 males. For every 100 females age 18 and over, there were 84.2 males. The median income for a household in the city was $68,125, and the median income for a family was $97,163. Males had a median income of $72,350 versus $37,538 for females. The per capita income for the city was $45,456. About 0.5% of families and 1.3% of the population were below the poverty line, including none of those under age 18 and 6.3% of those age 65 or over. The Johnson County Library services Fairway, KS. The library has 13 locations in Johnson County. ^ "2010 City Population and Housing Occupancy Status". U.S. Census Bureau. Archived from the original on July 21, 2011. Retrieved August 15, 2012. ^ "Fairway, Kansas". JoCoHistory. Johnson County Museum. Retrieved 12 June 2014. ^ Fairway, KS -- Welcome to Fairway, KS, Fairway city website. Accessed 2008-05-26. ^ Sharp, James Roger; Sharp, nancy Weatherly, eds. (1997). American Legislative Leaders in the Midwest, 1911-1994. Santa Barbara, CA: Greenwood Publishing Group. p. 120. ^ "Melissa Rooker's Biography". Vote Smart. Retrieved 2016-03-25. "Thomas Johnson's Story and the History of Fairway, Kansas". Joe H. Vaughan, Author. (2014) ISBN No. 978-63173-140-2. Two Trails Publishing Co., Inc., Independence, Mo. 64052. Wikimedia Commons has media related to Fairway, Kansas. This page was last edited on 20 September 2018, at 05:31 (UTC).